Exeggcute Should be Executed - Pokemon One a Day! ...No. Just no. I'm done. Anyone who wants to tell me that Gen 1 had the best designs can GTFO right now. But no, I would never say or ask that of you because I enjoy your company and checking out my series. So stay despite that last request. Yes, you, back in the chair. Thank you. I want to quit this series just because I've reached number 102 and am reminded that Exeggcute is a real design. These eggs evolve into a walking palm tree with coconut heads. I'm done. Pokemon One a Day, it was a fun trip, but this design has defeated me. What makes me laugh and angry at the same time is that there is a Pokedex entry that reads as follows: "It is often mistaken for eggs," to which I say, you mean eggs as in the official classification that denotes ExEGGcute as the "egg" Pokemon? LOL I'm not even gonna bother venting any further because this is hilariously stupid. Oh, and I'm not buying that these are seeds, which was the route they could and should have gone. For one, it would make sense to label it a grass type, and Exeggutor would TOTALLY make sense as an evo. 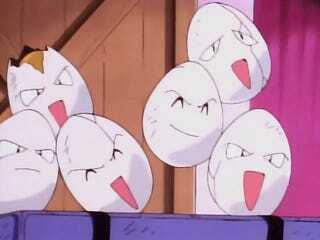 So if I hate Exeggcute and his evo so much, why didn't I redesign them as seeds which would have been a better choice? Because I did a redesign yesterday! And this project should stay fresh by varying the approach I take...In this case, let's revel in the stupidity that is Exeggcute, but let's at least spruce things up. Obviously, the inspiration here was taking the eggs and dress them in the style of Easter eggs. That's really just about it! No special meanings, no hidden connections, just something that's fun and cute to look at. Each egg was given a distinct personality, as well as dressing. 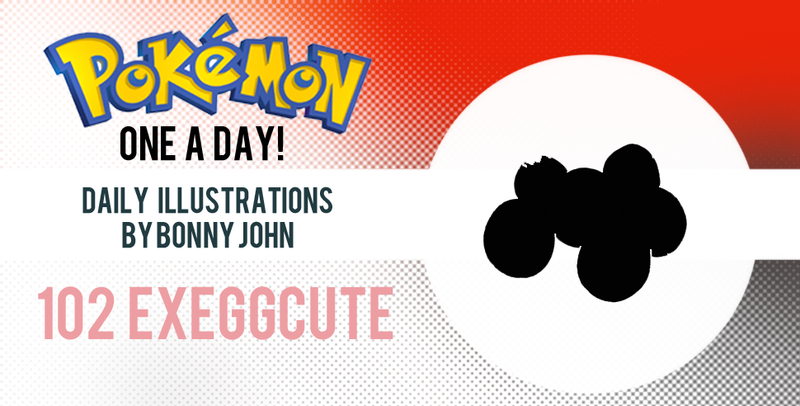 I varied up the colors to further separate them, and the piece was very straightforward in exeggcution. I had black outlines as a guide to fill in the eggs but decided to invert them to give the piece a low abstract approach. The eggs are overlapping one another in arrangement, a design choice that I think makes the piece very clean in presentation, in addition to the very flat coloring. I thought perhaps I could have rendered things out, but that would create a lot more work than needed for the Pokemon. Besides, I had just rendered out Electrode yesterday, so this flat approach is a nice contrast to that. The colors all really pop out and sit well on the page thanks to this choice. I hate Exeggcute and ask that we should get together and fry them up for an egg sandwich for breakfast one of these days. Actually, I think they wouldn't bother me so much if they weren't psychic types. And perhaps they weren't eggs or pink. Grass type only as brown hairy seeds with faces , Nintendo! That is the redesign you need to do if you ever decide to reboot the franchise to fix up stupid Pokemon like Exeggcute! For now, happy fake Easter courtesy of the Easter Lopunny!